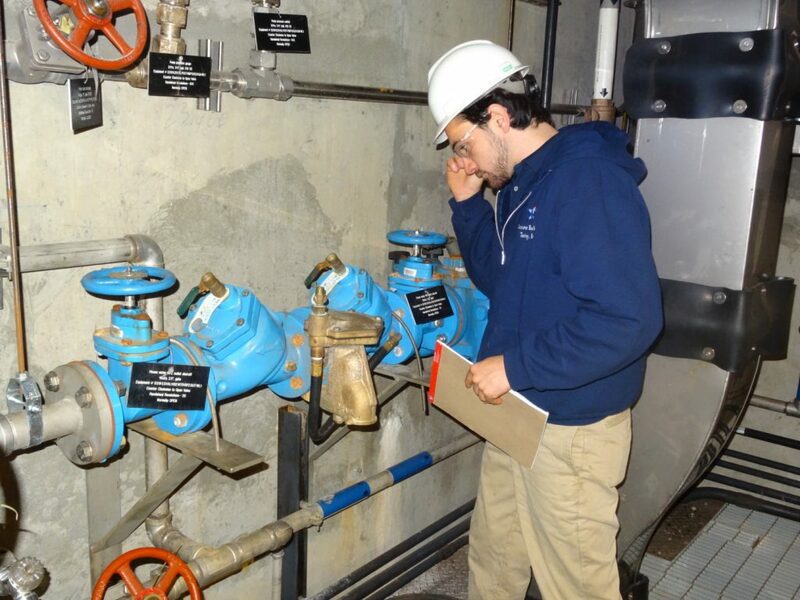 On-site evaluation and analysis to determine the best backflow solution for your building. Our Professional Engineers will design a backflow system that meets the requirements of the NYC DEP or the local water supplier. We will notify the DEP or water supplier that we are addressing your violation and prevent you from receiving additional violations and potential fines or the threat of having your water shut off. We will deliver the design plans and documents to The DEP or water supplier and expedite the approval process. Our Licensed Master Plumbers will install a backflow system in strict accordance with The NYC DEP, federal, state and city codes. Our Licensed Backflow Testers will perform the required annual testing. All backflow prevention devices must be properly maintained and are required by NYS law to be tested and inspected by a certified tester annually. This is nothing to stress about. Accurate Backflow Testing will take care of this for you and we will even remind you when it’s time to have your backflow device tested each year. It’s just one less thing for you to worry about. Automatic reminders two months before each device is due for a test. We’ll make sure you’re up to code and avoid costly violations. What to do if I received a violation or notice from the DEP or my local water supplier? If you received a violation or notice from the DEP or your local water supplier, don’t panic. Accurate Backflow Testing can help. We have excellent relationships with the DEP and most water suppliers on Long Island. With our decades of experience we can assist you through this process making it painless for you. Prices can vary between different types of commercial properties, between different types of business establishments or the size of residential building you own. Prices are also based on the number of devices per building, the size of each device and which particular device the Water Supplier requires for your specific property. For a more information or for any other questions you might have, call Accurate Backflow Testing now at (631) 224-7817. If you wish, we can get you scheduled for a no-cost, no-obligation onsite building inspection. Afterwards, we will offer you a free consultation which will help you make a stress-free decision as to what you would like to do next. As a business owner, property manager, or homeowner you are busy dealing with the day to day issues of operating your primary business and the many important matters you must deal with on a daily basis. It can be difficult to remember to set up your annual backflow inspection. That’s why Accurate Backflow emails automated reminders to you each year, 30 to 60 days prior to your inspection and certification due date. Accurate does not want to see you become the victim of a citation during a surprise city inspection, and we do our best to help you remember to schedule your certification. In addition we also maintain electronic copies of your past backflow inspections, in the event you may have misplaced your paper copy and need proof of backflow certification. Accurate Backflow customers do not have to be concerned over details regarding their backflow assembly testing. When you are a customer, Accurate maintains the record-keeping portion of your corporate backflow program as part of your backflow certification. We will keep track for you of the size and manufacturer your device is, as well as the location of it. This way, in the event of an emergency, you need not waste any time trying to locate these important details. It’s hard enough to remember birthdays and anniversaries, and Accurate Backflow understands this. With all of the maintenance your building or business already requires, a backflow certification might be the last thing on your mind. Thirty Days prior to your due date, Accurate will contact you to schedule an appointment to ensure your continued compliance with local, state and EPA requirements. This is just another way Accurate Backflow makes your life easier.